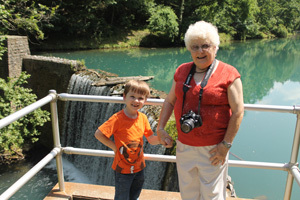 Recently, Lee and I took our six-year-old great-grandson Timothy on a day trip to Blanchard Springs Caverns in the Ozark-St. Francis National Forest, located about 50 miles north of our home in north central Arkansas. Timothy had never been inside a cave. We tried to prepare him for the vast darkness, the dampness, and the ghostly sensation of walking along a path around dimly-lit rock shapes. We could not. He had no reference point. Timothy excitedly accepted our invitation, yet, he expressed anxiety. After purchasing tickets, we had time to go into the Water Works Museum and view exhibits about the cave and its wildlife. Still, a simulated cave wall does not give the true picture of the inside of an underground cavern. After our tour, we watched the movie “The Amazing World Below,” which re-emphasized some of the concepts we learned while in the cave. On the tour, we inched in a group along paved walkways with handrails, listening to the guidance of a National Forest Interpreter. He said the Dripstone Trail was the first opened to the public in 1977. Blanchard Caverns is a “living” cave, meaning the glistening stalactites, stalagmites, columns, and flowstones are slowly, but constantly, changing. The crystalline formations are the result of minerals deposited by water dripping from above ground through crevices in the rock ceilings and walls. The trail travels 1.2 miles through two huge rooms; the Cathedral Room’s ceiling rose 100 feet above our heads. Local folks had known about the ancient cave since, at least, the 1930s. 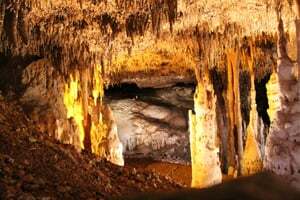 I first knew about the underground world from my brother-in-law, who fascinated our family with tales of exploring the hillside above Blanchard Springs. He almost fell into an unknown entrance to the cavern. Sliding down a steep mountain, he narrowly missed dropping into a hole that turned into a 65-foot vertical shaft into the mountain. He and two teenage friends went home, gathered a rope, a three-day supply of food, and returned to the natural entrance. Looping their rope over a log, they lowered themselves into the darkness. Once on the cave floor, they believed they walked where no human had ever walked. Perhaps they did. However, other young men started exploring the cave by 1955, about the same time he and his friends dropped down into the mysterious blackness. Other explorers discovered the skeleton of a 1000-year-old Native American with an obvious fractured skull, ribs, and leg. No one knows—or will ever know—if the man fell into the cavern, or if he was banished by his tribe as a punishment. Or perhaps, like my brother-in-law and friends, he dropped down the shaft, but could not climb out. Another young explorer describes entering the cave with friends by the same shaft, their only lights: flickering carbine lamps on their hard hats. They noticed reflective tape in a crevice overhead. (Someone obviously had been there before them!) Two of the boys climbed up a steep and narrow passage to inspect and suddenly found themselves in a dark void. They had climbed from a large room. How could there be another cave on top of the one where they had first descended? With their dim lights, they excitedly paced off the room, estimating it to be a half mile from end to end and filled with spectacular crystalline formations. They had discovered what came to be named the Cathedral Room, a part of the Dripstone Trail we walked on that warm June afternoon. By 1963, the young explorers turned over their notes and photographs from the cavern to a forest ranger. The National Forest Service closed off both the upper and lower caves to spelunkers. For a decade the agency planned and developed the caverns, including blasting a tunnel as a new entrance, putting in walkways and handrails, and installing an elevator to transport guests deep into the mountain. In 1973, the Dripstone Trail officially opened to the public. By 1977, the Discovery Trail opened, touring the lower cave and the river 366 feet below the forest floor. 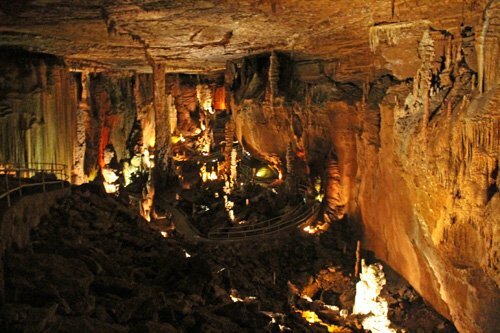 Ranked among the 10 most outstanding caves in North America, Blanchard Springs Caverns is the only developed cave system operated by the U.S. Forest Service. 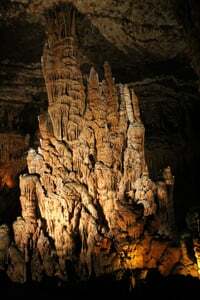 In development, three levels of Blanchard Caverns were discovered. In 2001, the Wild Cave Tour opened by reservation only. With no walkways or lighting, cavers climb steep slopes and crawl on hands and knees through red clay deep in the cavern’s undeveloped zones. A ranger told Timothy he could return for that tour when he turns 13. He’s already making plans! Dripstone is the shorter, easier trail traversing almost half a mile one-way through the caverns. Fifty steps are on the trail, but all stairs can be avoided, making trails accessible for wheelchairs and strollers. The one-hour tour is offered daily April through October and Wednesday through Sunday from November through March. Temperature on this tour is a constant 58 degrees, so plan on a jacket or sweater to be comfortable. The Discovery Trail on the lower level is open June through August. The 1.2 mile trail is more strenuous and runs about 90 minutes. Going to the lower part of the cavern, the trail has approximately 700 steps. The tour takes the routes of the early explorers with a look at the natural entrance where the young men I mentioned earlier dangled from ropes on homemade harnesses. The trail reaches the underground stream that runs through the caverns, originally carving out its creation. The stream eventually gushes from the mountain as Blanchard Springs. Discovery Trail has fewer formations than the Dripstone Trail. 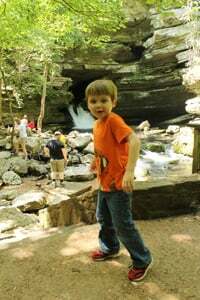 The Wild Cave Tour—the one Timothy plans to take when he’s 13—is an experience in off-trail caving, but in a structured environment. The tour is limited to a minimum of three, but no more than 12. A three to four-hour tour, participants are furnished hard hats, kneepads, gloves, lights, and belts, as well as a souvenir tee-shirt. Visitors are advised to be in good physical condition, to wear sturdy boots, and be prepared to get dirty! Long before I knew about Blanchard Springs Caverns, I enjoyed Blanchard Springs and its surrounding area and hiking trails. Blanchard Springs is the headwaters for Mill Creek that, along with underground springs, forms Mirror Lake. The lake spills over a man-made dam, built by the Civilian Conservation Corps (CCC), creating a frothy waterfall. Ruins of a stone mill can be viewed from a boardwalk trail above Mill Creek. The creek joins Sylamore Creek and runs through Blanchard Springs Campground. The campground accommodates tents and small campers, but not large rigs. Campgrounds for larger rigs are available in Mountain View. From Mountain View, take Highway 5-9-14 north for 5 miles to Allison. At Allison, take Highway 14 west for 8 miles towards the town of Fifty Six. Blanchard Springs Caverns is marked by a brown sign on the right. Turn right and follow the road to the Blanchard Springs Caverns Visitor Center.